Welcome to Our Savior's Lutheran Church, a ministry of the Evangelical Lutheran Church in America. 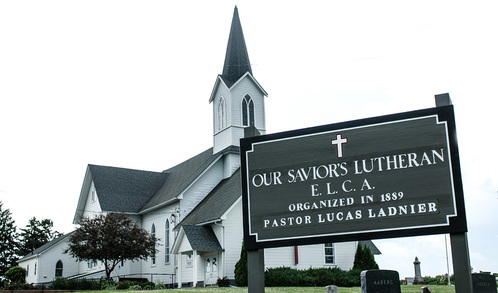 (The ELCA) Our Savior's Lutheran is a dynamic congregation ministering to people of all ages and places. From providing to a food pantry to peoples of many countries we feed body and soul and embrace God's children of all ages. Worship is central to our faith life at Our Savior's Lutheran. All services include the sacrament of Holy Communion and our primary worship resource is the ELW. Our music is varied and we have choirs for all ages. Worship happens at 9:00 am at Our Savior’s with fellowship hour to follow. Ministries of Our Savior's include but are not limited to: combating local and global hunger, Operation Christmas Child, domestic mission trips, youth and family events, Luther Point Bible Camp, WELCA, MIM, choirs, care for the homebound, education and anyway that we make Christ's name known.